Purdue unveils plans for Tyler Trent Memorial Gate. LAFAYETTE — Purdue University will create a permanent campus memorial in honor of superfan Tyler Trent who died earlier this year after a battle with cancer. 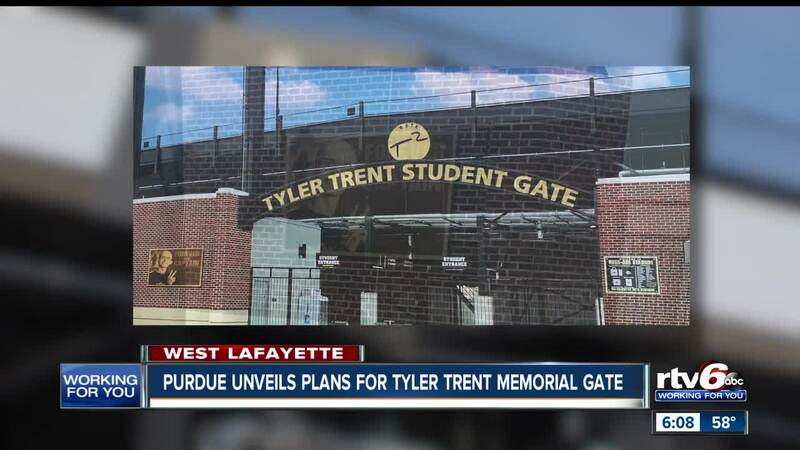 Purdue President Mitch Daniels revealed Wednesday that Gate E of the stadium will now be Gate T² "Tyler Trent Student Gate." A plaque will also be posted at the entrance witha picture of Tyler that reads "Forever our Captain" and shares Tyler's story. Daniels also announced the recipient of the inaugural Tyler Trent courage and Resililience Award at the unveiling as Sean P English, who lost his leg when he stopped to help a broken down vehicle and was struck by another car. The scholarship will be given annually to undergraduate students who have encountered adversity while attending Purdue. Tyler died on New Year's Day after a courageous battle with Osteosarcoma, a rare form of borne cancer. The former Purdue student used his fame to help cancer research and gained national attention when he attended Purdue’s upset win over Ohio State earlier this season. After that, he began raising money for the Tyler Trent Cancer Research Endowment to support cancer research at Purdue University. You can watch the announcement from Daniels below.